The minimalist design of the Just Silence hot tub by Villeroy & Boch is inspired by contemporary architecture trends and integrates harmoniously in modern living environments. Thanks to the reduced form and straight lines, they become a fuss-free design highlight on the terrace. 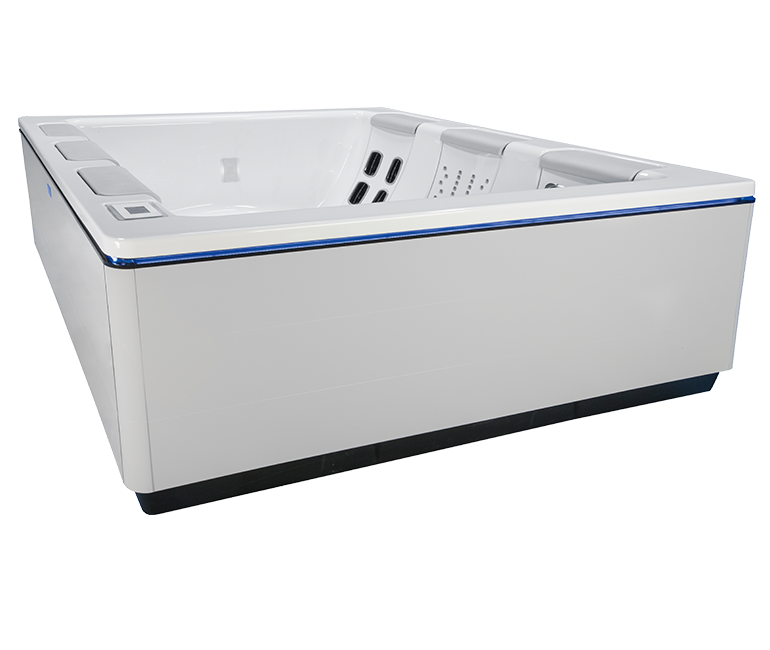 Thanks to its unique pared-down design and straight lines, the Just Silence hot tub offers a novel seating and reclining concept, providing more space for greater comfort while enabling relaxed face-to-face conversations with friends. Just Silence allows up to five people to sit opposite each other without sacrificing legroom. The model, with 3 JetPaks boasts striking and high-quality features: a user-friendly illuminated touchscreen panel, an optional integrated stereo system with Bluetooth connection for perfect musical pleasure as well as an all-around light strip and illuminated waterfall for atmospheric lighting. Please come along to Smiths Garden Centre in Uxbridge to view.